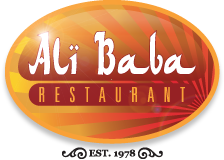 For more than 38 years, Ali Baba Restaurant has been serving up Mediterranean and American cuisine to the Morgantown and surrounding areas. Ali Baba’s has become a destination of Morgantown locals as well as international travelers from around the country seeking authentic Middle Eastern cuisine. Centrally located at the Morgantown Municipal Airport, Ali Baba’s provides great food in a warm and welcoming environment with an unique atomosphere.